People have been fascinated with "artificial beings" for thousands of years. Around 400 B.C.E., the Greek mathematician Archytas of Tarentum built a mechanical bird to try and better understand how birds fly. 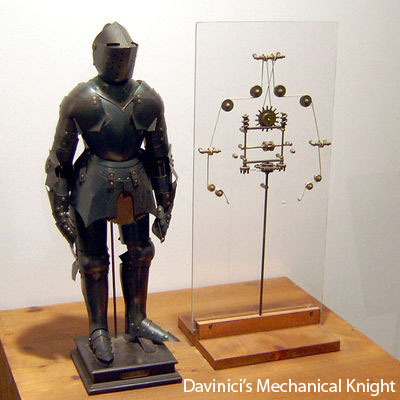 Around 1495, Leonardo DaVinci publishes designs for a mechanical knight. Over the next 400 years, several toy automata are built, largely for the entertainment of royalty. The word "robot" is first used in 1921 by Czech playwrite Karel Capek in his play R.U.R. (Rossum's Universal Robots). The play involves a factory that builds artificial people to be servants for humans. In the 20th century, the digital computer is invented.Researchers quicklystart referring to the computer as an "electronic brain" and start thinking about ways to build robots with computer brains. In 1966, Shakey the Robot is invented at Stanford. 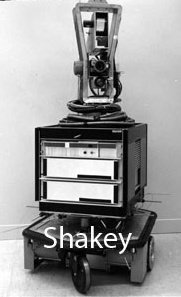 Shakey was the first autonmous, intelligent robot that made its own decisions about how to behave. Shakey could be given general instructions, such as "move the block onto the table" and it would reason how to perform the task. This would involve looking around the room, identifying the block and the table, and then figuring out how to get the block to the table, including navigating around any obstacles in the room. In 2004 Shakey was inducted into Carenegie Mellon's Robot Hall of Fam. Researchers in artificial inteligence have made significant advances in the science of creating intelligent autonomous machines. These machines have been improvements on Shakey that can reason about a wider range of tasks; vehicles that can drive, sail, or fly on their own; or robots that model how animals, from insects to dogs, behave. Others have focused more on creating artificial limbs that can move and act like human limbs. Some of these have been constructed in conjunction with neuroscientists to create prosthetics that can respond to human neural impulses. Still others have focused on trying to build humanoid robots. 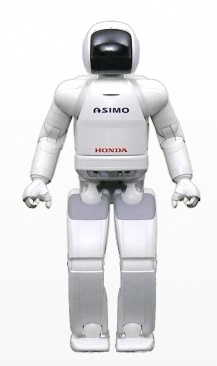 The earliest of these robots, such as Honda's ASIMO, are clearly mechanical beings built to mimic the basic form of human beings. More recent attempts like ACTROID have even tried to mimic human skin and facial expressions. Over the rest of this curriculum we will be exploring in more detail how these various robots are constructed and programmed.